BarBacon features uniquely delicious and savory bacon dishes in the heart of NYC’s Union Square. When that bacon craving strikes, you can choose from our satisfying $15 lunch menu, featuring NYC’s best Classic BLT, Carnitas Cubano, Kentucky Fried Banhi Mi, Smoked Chicken Club Sandwich, Bacon Chicken Caeser Salad, Kale Salad and more! You won’t find a better lunch value and experience than at BarBacon. Bacon is more than just your breakfast go-to. Indulgence is for lunch. BarBacon in Union Square is now the best place to get your midday bacon fix for lunch. Unwind during the day with craft cocktails and the salty, savory sweetness of deliciously cured bacon during $15 Lunch at Union Square's BarBacon. Chef-driven pork small plates and a full list of cocktails, beer and wine all in a laid-back environment. BarBacon makes lunch sizzle with the freshest, thickest sliced bacon dishes, packed sandwiches, fresh salads and a modern, handcrafted drink menu. BarBacon specializes in two of food’s biggest taboos: salt and fat. Lunch is the perfect opportunity to indulge yourself in one of the most unique dining and drinking environments in New York City. Satisfaction sizzles in a trendy, street-art inspired space where your senses are awakened with the sights, sounds and smells of our chef-driven, uniquely delicious bacon dishes and awe-inspiring cocktails. 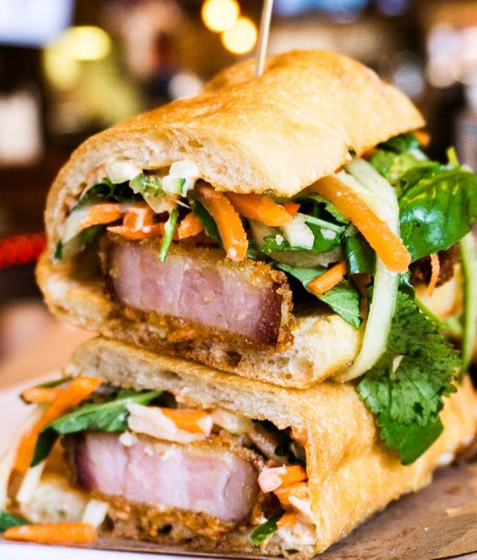 When the midday bacon craving strikes for lunch, head to BarBacon in Union Square. Margarita Monday at BarBacon Union Square includes $7 margaritas and $5 tacos. Mondays in NYC don’t get any better than the tacos, tequila and bacon at BarBacon in Union Square. There’s no better place in NYC for beer, bacon and games. Play corn hole with friends or go head-to-head with BarBacon beer pong with our list of craft beer and chef-driven bacon menu. Because Tuesday also means our expert Chefs Peter Sherman and Nicholas Karoly release their special menu. Wednesdays are your chance to go Hog Wild at BarBacon. Order $10 plates of our savory and spicy wings any way you want them all day. Ladies drink for less every Thursday at BarBacon. Browse our extensive wine list and enjoy $4 glasses and sizzling specials on appetizers during Ladies Night. Finish off your week right with friends and coworkers during BarBacon’s extended Late Night Happy Hour. Our late Night Happy Hour drink specials and food menu run from 11PM-2AM. Brunch is better at BarBacon. Start your Saturday off right with mimosas, bacon-packed Bloody Marys and one of the best brunch menus in all of New York. Come for brunch on Sunday and stay for football. From 1PM-12AM, enjoy BarBacon Sunday specials on beer and bacon cheeseburgers during football Sundays. Bacon has always belonged to the bold. American-made bacon has always carried a label of excellence is taste and consistency. But not all bacon is created equal. So BarBacon hand-selects its pork belly from small farms across New England, the Ozarks and the upper southern United States. These farms have a rich history of raising outstanding pork that serves as the basis of our outstanding bacon lunch menu. It is this rich history that our chefs and bacon connoisseurs draw their inspiration from. Born and raised in New York, Chef Peter Sherman is an emerging culinary talent with a well-grounded passion and knowledge of the New York City food scene and what patrons want when it comes to dining. He’s nobly worked for and under some of the best chefs in the world including Joel Robuchon, April Bloomfield and David Bouley. He’s continuously and tirelessly pushing the pork envelope with innovative and exciting new takes on bacon dishes. At BarBacon, he expertly employs bacon’s blank flavor canvas and leads the creative culinary charge with bacon-fueled lunch items that satisfy the sweet, salty and savory craving. 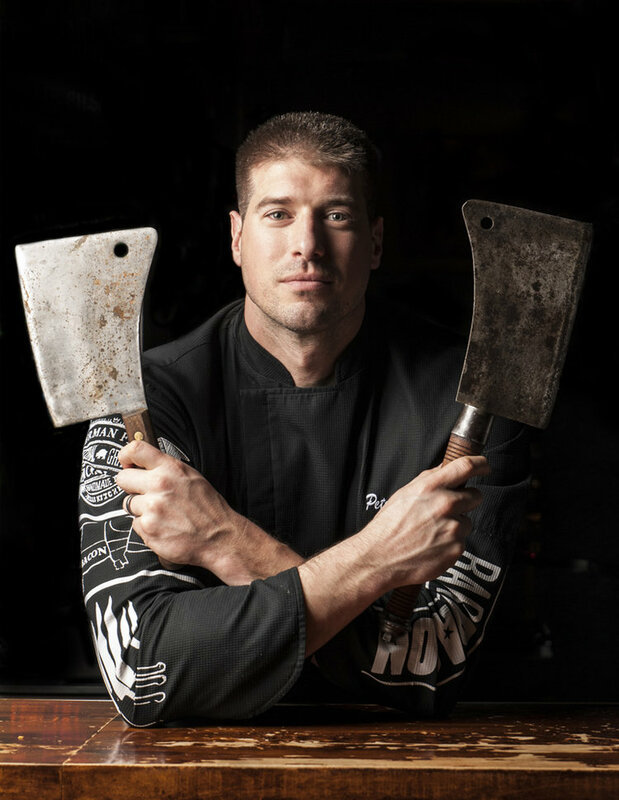 Chef Nicholas Karoly is an expert culinary mind and whole animal butcher hailing from Upstate New York. He’s managed some of New York City’s best and most high-end steakhouses before finally succumbing to the king of all meats: bacon. Since joining BarBacon as Executive Chef in 2017, he’s quickly but carefully crafted a lunch menu that’s brimming with bacon indulgence. By showcasing the very best of bacon while incorporating his decades of fine dining experience, he deftly delivers bacon-forward dishes that satisfy even the deepest of carnivore cravings. For the finest bacon-filled lunch, for only $15, visit BarBacon in Union Square and experience the sweet, salty, sizzling satisfaction of fresh, delicious bacon.